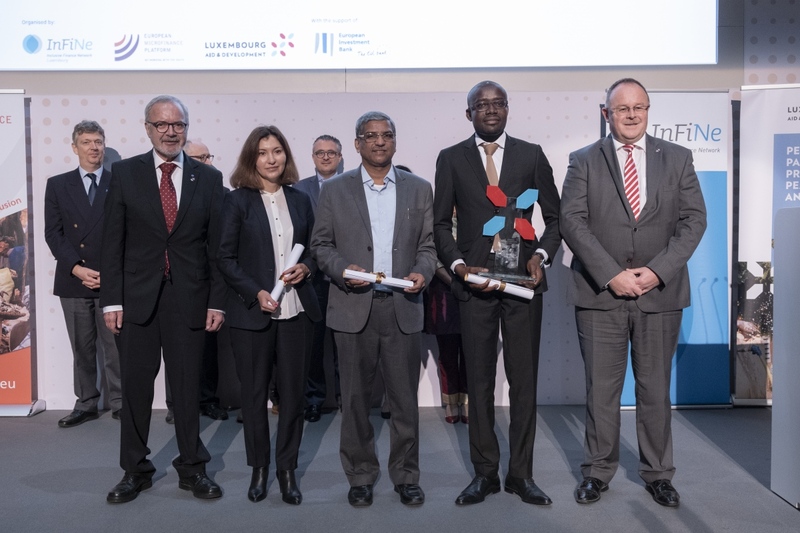 Financial Inclusion through Technology was the topic of the €100,000 European Microfinance Award 2018, and on the 15th November saw the long-awaited ceremony at the European Investment Bank, presenting the three Award finalists and the winner – Advans CI of Ivory Coast, which won for its innovative digital savings and credit solution, in partnership with a leading MNO, for cocoa farmers. The High Jury reported a close decision, with outstanding applications from the two other finalists, ESAF Small Finance Bank of India, and KMF of Kazakhstan. Thank you to the 27 institutions from 22 countries, representing nearly every geographical region, who applied. Winner: Advans Côte d'Ivoire (Advans CI) is a NBFI in the Ivory Coast which offers payment, saving and credit services enabled by an Advans account linked to a MTN mobile money account. Advans CI has responded to traceability and safety issues faced by cooperatives paying cocoa farmers, as well as low school enrolment due to lack of regular cashflow among farmers, by offering its digital savings and payment solution, with wallet-to-bank and bank-to-wallet transfer services, enabling producers' cooperatives to make digital payments to farmers for their crop revenue. Since 2017, Advans CI has been also providing small digital school loans, based on an algorithm reflecting farmers' cashflows. Advans CI also successfully negotiated free MTN transfers between mobile wallets and Advans accounts for their farmer clients – the first time this had happened in Ivory Coast. The Selection Committee was impressed by Advans CI's thoughtful and holistic solution to an identifiable problem, and its negotiation on behalf of its farmer clients. Finalist: ESAF Small Finance Bank is an Indian MFI that is leveraging the rapid expansion of mobile phone and smartphone penetration in India to digitise a wide range of its lending processes, in particular customer onboarding, electronic applications, customer financial training, credit appraisal, in-field verification, mandatory customer identity and address verification using eKYC, as well as opening of accounts, cashless disbursement and paperless collections of loan repayments. ESAF's field officers use Internet-connected tablets with biometric identity verification and its clients have QR-enabled Aadhaar Cards – with Government-issued 12-digit unique identify numbers based on biometric and demographic data. Their details are automatically transmitted for credit bureau verification, and clients are given ATM cards to withdraw money in convenient tranches from any ATM. ESAF was commended by the Selection Committee for its huge outreach (over 2.3 million clients benefitting from these solutions) and its twin focus on back and front end solutions.